Elegance & Elephants Bubble Shorts .PDF Giveaway! – Everything Your Mama Made & More! DIDN’T WIN? That’s okay! Elegance & Elephants aka E & E Patterns is also offering an exclusive 10% coupon code to EYMM followers. Use code MAMAMADE until 6/5 to get 10% off your order in the E & E Pattern Shop. I seriously never win anything so when a friend tagged me on Facebook because I won a free pattern from Elegance & Elephants I was over the moon. 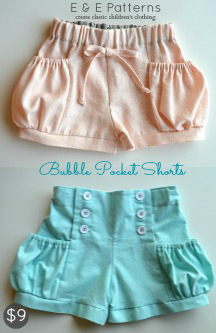 Heidi is newer to the .pdf pattern designing market but she is starting out great, these bubble pocket shorts are super cute. I LOVE the classic version made up in knit, they are the perfect play shorts and way better quality then the play shorts you find in stores. 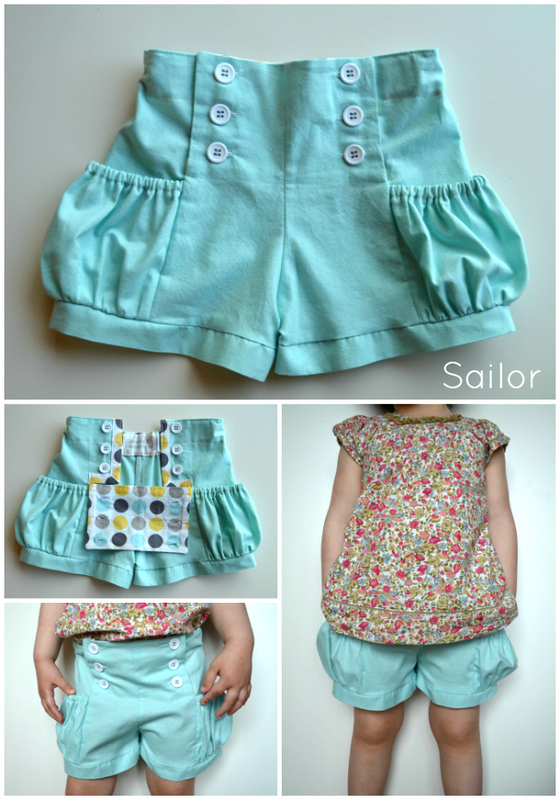 Sailor shorts are all the rage right now & her sailor version is the perfect version for little girls & you could easily make them without the bubble pockets as well! While I haven’t finished mine yet because I am backed up with other projects, I found the pattern to be well written & the quality of details in the work to be awesome. When I told her I thought my readers would love them she offered to giveaway a .pdf copy of the pattern AND offer up a 10% code to her shop for any of my readers who didn’t win and wanted to purchase it. If you check google images you can find pictures of lots of different ideas from others who have made them including this adorable outfit from Project Run & Play made using both her patterns! 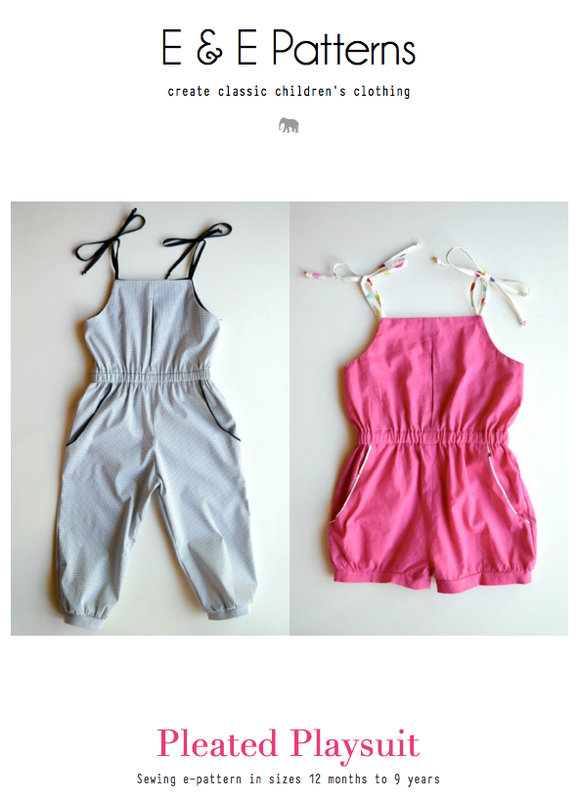 If you want to try out one of her patterns for FREE she just released a free girls romper pattern and instructions for down sizing it to 3-6m & 6-9m as a thank you for the support of her customers. It is super cute & will give you a feel for how she designs her patterns. She also has a bunch of great free tutorials as well! ELEGANCE & ELEPHANTS .PDF GIVEAWAY! TERMS & CONDITIONS: Contest open to anyone with an email account & access to a printer. Patterns are digital .pdf files that will be emailed to the winner. Winners are responsible for printing them on standard US letter sized paper on their own. Limit 1 prize per person. Enter up to 3 ways now until 12am EST 6/4. Including comments & liking FB pages. To enter check out her awesome site and then comment on THIS POST which style of shorts you would like to make most (the pattern includes both 😉 ). If you win that is the pattern that will be sent to the email address you provided. After you comment to be entered you MUST VISIT RAFFLECOPTER TO FINISH ENTERING you can do so HERE. After commenting it will give you 2 ways to earn bonus entries. Don’t want to wait a week for the giveaway to end??? You can purchase it in her shop right now and use the discount code MAMAMADE for 10% off until June 5th. Also don’t forget there will be other giveaways going on all this week so check them all out! I’d like t make the classic version! My daughter would just adore those pockets. I would love to make the sailor version! Super adorable. Nice love the bubble pocket shorts! I just think these shorts are ADORABLE! The sailor version is adorable – but I think the classic is more practical. Wow both patterns are amazing but I am particularly excited about the sailer shorts. I feel my daughter would look adorable in them. I’d love to make the knit version! Oooooo, I LOVE that Sailor style!! Love the plain bubble and the sailor with no bubble for older girls. I would make the classic version first. Those are so cute, I love the sailor version! sailor, definitely!!! I love both styles though!!! I love the sailor version! I LOVE THE SAILOR VERSION!!! I love the classic ! I’d make both versions!! 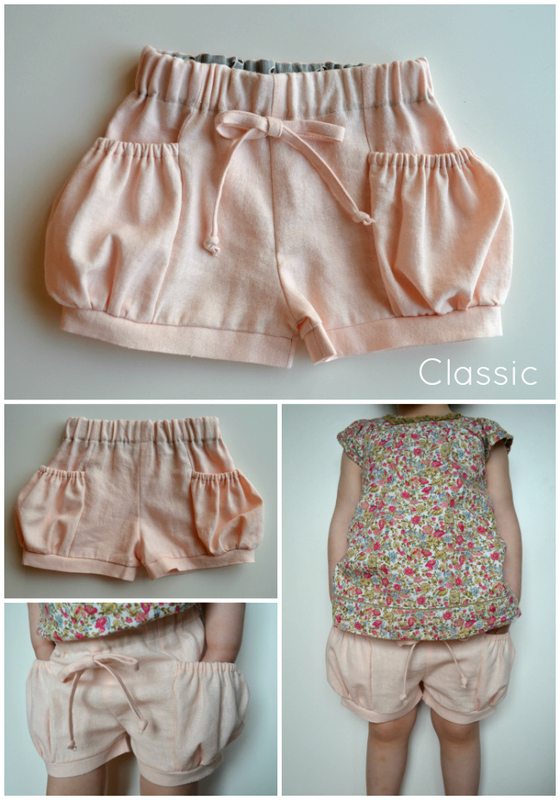 The classic elastic waist shorts for the younger grand-daughters and the sailor ones for the 8 yr old!! Love them!! I love the classic, but I will definitely make them both! I love both, but I think I like the classic better for my little girls. I am in LOVE with Sailor stuff these dys so I’d like to make those !! Super cute !! Thanks for the giveaway !! I love the classic but both are adorable! I would make the classic style 1st but would make the sailor ones as soon as I could try the classic ones on her. Love both styles!!! I am certain I would make both versions, love them both! I love the classic version! I would definitely make both but I think the classic ones first for all my nieces! If I have to choose… then Classic are my favourite! Cheers. I’d make both! Who doesn’t need more cute shorts??? oh, pick me, pick me!! i have the link to their page as a tab on my desktop, but because its coming into winter here, I’m trying to have some self control and wait till at least the very beginning of spring to buy it! They are lovely shorts. Love making adorable clothes for my little one! I like them both, but I think I would go for classic style first!